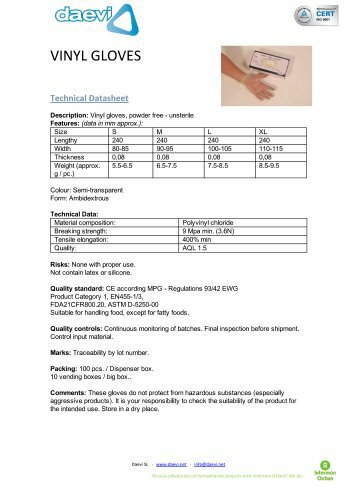 Description: Vinyl gloves, powder free - unsterile Features: (data in mm approx. ): Risks: None with proper use. Not contain latex or silicone. Quality standard: CE according MPG - Regulations 93/42 EWG Product Category 1, EN455-1/3, FDA21 CFR800.20, ASTM D-5250-00 Suitable for handling food, except for fatty foods. Quality controls: Continuous monitoring of batches. Final inspection before shipment. Control input material. Marks: Traceability by lot number. Packing: 100 pcs. / Dispenser box. 10 vending boxes / big box.. Comments: These gloves do not protect from hazardous substances (especially aggressive products). It is your responsibility to check the suitability of the product for the intended use. Store in a dry place. Daevi SL • www.daevi.net • info@daevi.net Do you collaborate on humanitarian projects with Intermon Oxfam? We do.